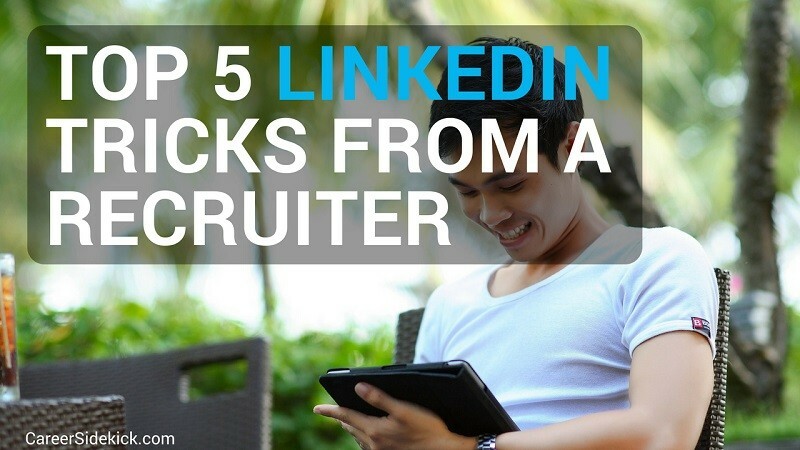 I’m going to share my five best LinkedIn profile tips to help you get noticed immediately by recruiters, employers, and anyone else who is searching for talent on LinkedIn. You want more clicks and views, but you also need to impress people once they click or they’ll just leave. So we’ll cover how to get clicks, but also how to look great once someone is already viewing you. Keywords help you get found in search results on LinkedIn. Recruiters run many searches every day to find people. That’s probably not shocking news to you though. The thing you might not know: Your skills count as keywords. Even if you don’t have a certain word anywhere else in your profile, putting it as a skill will make your profile show up when someone searches for that word or phrase. And LinkedIn lets you put up to 50 of them. It’s the best place to put a ton of keywords and not seem spammy at all. Take advantage and do it. Sure, you could go try to cram 50 keywords into your latest job or summary but it’s going to completely ruin your profile (and turn off anyone who reads it). So use this instead! This is probably my favorite LinkedIn profile tip because it takes just one or two minutes to do and can have a big impact on how many recruiters and employers find you in their searches. A recruiter or anyone else running a LinkedIn search is going to see 10 people per page in the search results. Then they’ll choose who to click based on just a few pieces of info (since they haven’t seen your full profile yet). Your image and your headline (the sentence right below your name on your profile) are the “big two” that they look at first. So you need to make sure your profile is great in these two areas. First, make sure your image looks professional and friendly. I don’t go around LinkedIn all day judging people on looks, but it’s human nature to have a reaction when we see a photo of somebody. Most people are very visual, and will automatically have some type of reaction to your photo. Even if it’s subconsciously. Then there’s the headline. It appears right beneath your name in search results (and right beneath your name on the “edit profile” page if you want to go change it). It’s usually in this format by default: Job Title at Company (i.e. – Software Engineer at Apple). If I searched for “software engineer,” and you had that headline, those words will be bold as I scroll past your profile. It’s a great way to grab attention and it immediately shows me that your profile is relevant to what I searched for. That has a lot more keywords and also gives people a much better idea of what your actual job is. Note: You don’t have to change anything in your employment history. We’re just changing the headline here. Don’t take this too far and make it spammy, and don’t make the headline too long. Avoid saying things like this: “Award Winning Inboud Marketing Expert and Published Author With 10 Years of Experience”. It’s too much, it looks like you’re trying too hard, and actually makes you less trusted. Also avoid having too many abbreviations or certifications in your headline (or in your name). It’s okay to put one, like PMP (Project Management Professional). A lot of people put this in their headline. John Brown, PMP. That’s fine. But one of the quickest ways to look like a spammer is to flood your profile with abbreviations. The people who put a ton of abbreviations in their name or headline are literally the last people on earth I want to talk to as a recruiter. I avoid them at all costs. Don’t do this to yourself! If you have multiple certifications, pick the one or two that matter most. There’s a saying I like a lot: “If everything is a priority, then nothing is a priority.” Choose the most important certification and forget the rest, otherwise the reader will ignore all of them and assume none of them are important. If you followed the two profile tips above, you should start getting clicks to your LinkedIn pretty soon. Now you need to make your profile impressive to the reader after they’ve clicked. The best thing you can do is get some recommendations on your profile. I wrote this article on how to get LinkedIn recommendations quickly and easily. I suggest checking it out. It has a word-for-word template you can use to ask people to recommend you, and six different ideas for the types of people you can ask (in case you’re thinking “I don’t have anyone to ask”). The goal is to get two or three recommendations. It’s the most attention-grabbing thing you can have on your profile. It’s also the most powerful thing for building credibility and making companies want to interview you once they’ve viewed you on LinkedIn. Your responsibilities don’t say anything about how good you were. What did you actually do? Be specific. Example: “Increased department revenue by 11% by acquiring 16 new clients throughout 2015”. So go take a look at your bullet points or job descriptions and think about whether you’re talking about what you actually did, or only what you were responsible for. By the way, this is a great way to improve your resume too. This isn’t just a LinkedIn tip. The four tips above are the best strategies you can use to quickly improve your LinkedIn profile. But there’s one more thing you should do, and it can help you with everything we just covered. Take a look at what other people in your industry are doing. Let’s say you’re a Scientist. Search on LinkedIn for “Scientist” and find a couple of profiles that look great to you. See what skills they are listing, or what their headline is. Try to notice what made you click their profile in the first place from the search screen. Now take what you observe and use it on your own profile. Blend a few ideas from the best profiles out there. You might see a great keyword that you forgot to use. You might see a way to make your headline slightly better. Etc. Overall, your LinkedIn profile will be much better if you’re looking for outside inspiration and not just going off of the ideas in your head. Start with your own ideas but don’t be afraid to use some of the best of what other people are doing. It’s a winning strategy that will help you immediately.